This will be the 7th rehearsal and 4th public performance of material the group has been working on since September 2018, and the final Vermont performance before a trip to metro New York and New Jersey on April 20th. Featured will be special guest Tony Demarco (http://tonydemarcomusic.net/td.bio.html) plus artist leaders, the full 2018/2019 Touring Group and invited alumni from previous years. 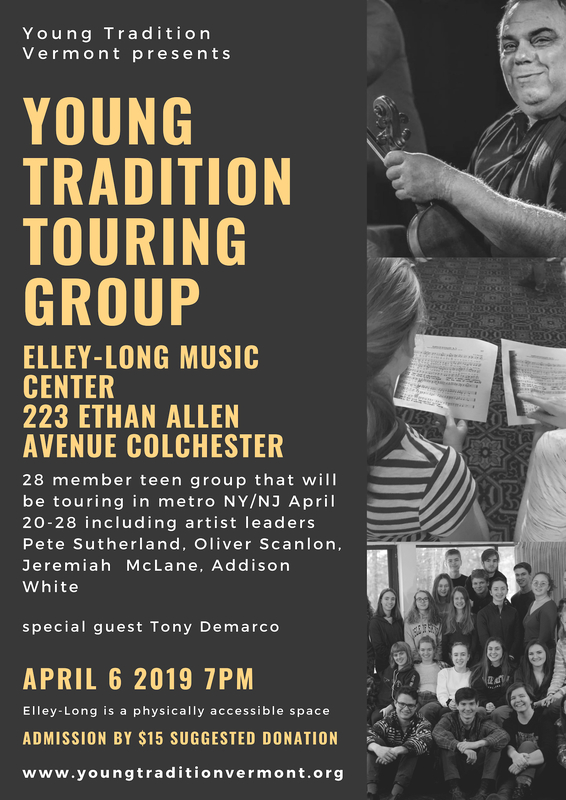 The final performance for this year’s group in Vermont will be at the Young Tradition Festival in Burlington the evening of 5/4/19. The group is supported by artist leaders Pete Sutherland, Jeremiah McLane, Oliver Scanlon, Addison White & manager Mark Sustic. For information about the Touring Group and Young Tradition Vermont visit www.youngtraditionvermont.org, see Young Tradition Vermont on Facebook, or contact Mark Sustic (mark.sustic@gmail.com).